The Uranium Club is a UK based record label specializing in Progressive and Art Rock, Heavy Rock and Metal and Electronica. The new label Uranium Club is saying that the label's intention is to bring us radioactive sounds for the 21st century. A bold statement but their first release, the Ghost Medicine project, got very good reviews in the press. progVisions will now review the second release of the label. A project with the intriguing name Kaprekar's Constant. The album is the brainchild of childhood friends, songwriters and multi-instrumentalists Al Nicholson and Nick Jefferson. Joined by the legendary Van Der Graaf Generator saxophonist/flautist David Jackson, vocalist Dorie Jackson (Francis Dunnery Band) and former Level 42 drummer Phil Gould. Their debut album is entitled “Fate Outsmarts Desire”. All songs are written by Nick Jefferson and Al Nicholson. The album is mixed and produced by Mike Westergaard. And exciting for the Dutch prog fans; the band will be performing next year at the famous Prog Dreams festival in "de Boerderij", Zoetermeer. The first thing I noticed is that on the inside of the beautiful digipak you will find an image of a painting of Sean Jefferson. The painting has a style that reminds me of the Dutch painter Jheronimus Bosch who made the amazing triptych “Tuin der Lusten” (“Garden of Lusts”). I am sure you will know the detail that was used on the cover of the “Aion” album of Dead Can Dance. Unluckily for the Dutch that panting is exposed at the Prado in Madrid. If you ever visit that city; check it out ... amazing painting. The painting of Sean Jefferson has of course a more positive vibe. But what about the music? On the labels website I read that the band's melodic sensibilities, epic arrangements and love of historical subject matter draw inspiration from the likes of Big Big Train and Genesis. Well using the name of Genesis is of course also a marketing thing. In 80 percent of the info sheets I receive today a band's music is compared with the music of (Peter Gabriel era) Genesis. Except for a short part in the song “Hallsands”, I don't see that connection. But I had to think immediately of the band Big Big Train when I heard the first highlight of the album, the long track (17:54) “Blue Bird”. But this has to do with the love of both bands for historical subjects and narrative storytelling. You can find three short tracks and three compositions of epic proportions on this remarkable album. The album opens with the nice short track “Hors D'Oeuvre” which immediately tracks my full attention because David Jackson is playing his saxes and flutes in a typical Van Der Graaf Generator style. It gives some memories of the golden VVDG period in which the band released classic albums like “Godbluff”, “Still Life” and “World Record”. Then it is time for the already mentioned first highlight of the album, the epic “Blue Bird”. Paul Gunn is responsible for the storytelling and he is a narrator who generates that typical British atmosphere. “Blue Bird” is a diverse track with great melodies and wonderful arrangements. The story is about John Godfrey Parry-Thomas a Welsh engineer and motor-racing driver who at one time held the land speed record. He was the first driver to be killed in pursuit of the land speed record. His car Babs was buried in the dunes at Pendine Sands, the place were the record was set in the year 1926. Some 42 years later in 1969 it was controversially recovered and over the next 15 years was restored by Owen Wyn Owen. For part of every summer, Babs is on display at the Pendine Museum of Speed, Carmarthenshire. Love the combination of the spoken voice and narrative character of the vocals that are wonderfully done by singer Bill Jefferson. The music is on the mellow side of the progressive rock spectrum. Beautiful acoustic and classical guitars combined with nice keyboard orchestrations. And as a bonus you get the exceptional sax and flute playing by David Jackson. Again I realize that the work of this man has always been underrated ... but he is and will be always one of my musical heroes. What a wonderful composition this is ... only for this track this album is a must buy for all the progressive rock lovers. “Pearl Of The Lake” is a beautiful sung ballad. The combination of Male and Feminine (Dorie Jackson) voices works very well. After this short track we are treated with the next epic entitled “Hallsands”. The song is about a village and beach in south Devon. A story about a fishing village and its demise. The village eventually fell to the sea by sand and gravel extraction ... the sea gives and takes. Like in “Blue Bird” you can find a beautiful instrumentation in this track. 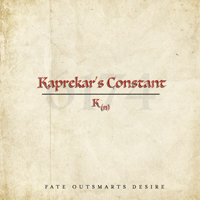 The music of Kaprekar's Constant has some influences from Folk and Classical music. The word to describe the music is beautiful. The music is never hectic or over the top. “Four-Faced Liar” includes some sound samples of police radio traffic that were recorded after the Boston marathon attack and while capturing the bomber. A nice little track that has delicious Mellotron strings. The title of the track is associated with a clock located on the custom house in Boston. Each face of the clock has always shown a slightly different time with no guarantee that any of them are correct. This remarkable album comes to an end with the last epic entitled “Houdini King Of Cards” A song about Houdini (Erik Weisz) the Hungarian illusionist and stunt performer, noted for his sensational escape acts. In this long piece singer Dorie Jackson, the daughter of sax and flute player David Jackson and known for her work with Francis Dunnery (ex it Bites), gets room to display her vocal talents. The other star of this track is her father David Jackson who treats us with exceptional flute playing. And if we hear his sax we immediately have to think of VDGG. The beautiful voice of Dorie is accompanied by delicate acoustic guitars, nice keyboard orchestrations and beautiful sax and flute melodies. A worthy ending of a remarkable album. Well probably you have already understand, this is a remarkable project and a beautiful album with great vocalists, a narrator and a lovely instrumentation. Of course all the credits are for the composers and multi-instrumentalists Nick Jefferson and Al Nicholson but I think that saxophonist and flautist David Jackson must be mentioned here also. He brings the music to another level with his exceptional playing. A wonderful album of pure beauty. A must buy for Big Big Train and Van Der Graaf Generator (David Jackson) fans. Highly recommended by progVisions.